The Blackhawks freed up some valuable salary-cap last week by shipping the rights of winger Marian Hossa to the Coyotes in a seven-player deal. A persistent skin disorder sidelined Hossa throughout last season and has all but ended his playing career. It also left the Blackhawks with over $5.2 million in dead cap space through 2020-21. Shipping Hossa’s contract to the Coyotes leaves the Hawks with over $74 million invested in 22 players for 2018-19. Several pundits are musing over what general manager Stan Bowman has in mind for that extra cap room. The Chicago Sun-Times’ Mark Lazerus believes the Blackhawks cannot go into next season with their current roster and expect to reach the playoffs in the increasingly competitive Central Division. Lazerus thinks the reacquisition of center Marcus Kruger in the Hossa trade could make Artem Anisimov and his $4.55 million annual average salary expendable. That could create more room to pursue Hurricanes defenseman Justin Faulk and/or teammate Jeff Skinner. He also suggests Canadiens left wing Max Pacioretty could be another trade option and wonders if they’ll consider swinging for the fences by chasing Senators defenseman Erik Karlsson. The Athletic’s Scott Powers also believes Bowman has enough cap room to pursue a top-six forward and a top-four defenseman. 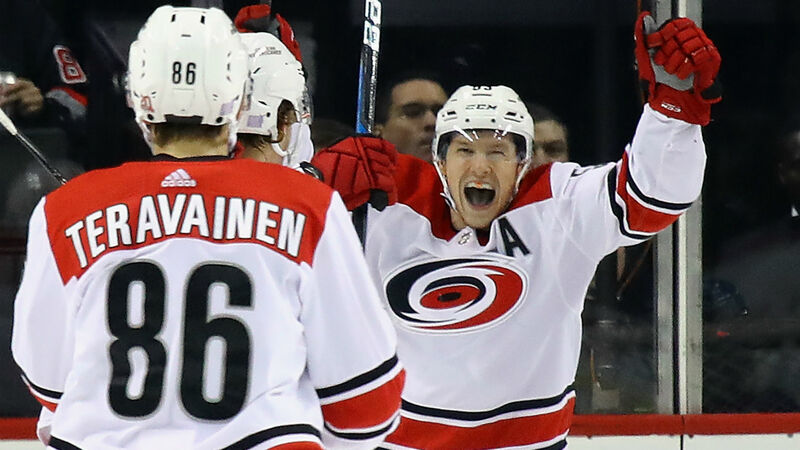 He cites a source claiming the Blackhawks GM contacted the Hurricanes about Skinner and Faulk, with the asking price being center Nick Schmaltz and a first-round pick. At first glance, the opportunity to land two skilled veterans by parting with a sophomore center and a first-round selection seems like a bargain for the Blackhawks. Doing so, however, would be seen as Bowman sacrificing more of his club’s future for a quick fix. Schmaltz, 22, tallied 21 goals and 52 points last season. His performance was among the few bright spots in an otherwise miserable 2017-18 campaign for the Blackhawks. Schmaltz’s departure would create a big hole at center on their second line. If the Blackhawks made this move, they could shift Skinner into the second-line center role. Still, it would leave them lacking scoring punch at left wing. Another option could be promoting Anisimov, provided he hasn’t been traded away in a cost-cutting move. Skinner could also prove a short-term acquisition. The 26-year-old left winger carries a $5.725 million cap hit for the coming season and is slated to become an unrestricted free agent next summer. He would likely prove too expensive for the Hawks to re-sign. Faulk, on the other hand, carries a more affordable $4.8 million cap hit through 2019-20. In an earlier report, Powers said the asking price for Faulk alone was left wing Brandon Saad. Based on the latest chatter, it appears the Hurricanes have backed away from that. Assuming the Blackhawks want to acquire Skinner and Faulk, they lack sufficient cap room to take on their combined $10 million hit. They’ll have to move out more than Schmaltz and his $925,000 cap hit to create sufficient cap room to make this deal work. Even if they include Anisimov in the deal or move him to a third team, the Hawks would still be bumping against the $79.5 million cap ceiling. Like Lazerus, Powers also thinks the Blackhawks could inquire about Pacioretty. Given the Canadiens’ dire need for skilled centers, they’re likely to also ask for Schmaltz. As for Karlsson, Bowman probably won’t get into the bidding war for the All-Star defenseman. The Senators want a good young defenseman as part of the return for Karlsson, having sought highly touted prospect Miro Heiskanen from the Stars and promising rearguard Mikhail Sergachev from the Lightning. The Blackhawks simply don’t have young blueliners of that caliber to make a competitive pitch.